If you would like to support this web site please click the Donate button below. Donations can be made by PayPal, or with a regular credit card if you do not have a pay pal account. Let us know if you have questions or suggestions. Thank you! We have a new site added to the Berea & BHS Links page: From-flower-power-to-peace-and-love-america-in-the-1960s! Suggested by Anna Jones, thanks Anna! With the help of Barbara Freeburn Harshey (BHS Class of ’67) and her great detective work, Barb has provided updates for the following classmate’s "In Loving Memory" entries; Joanne Cecila Driscoll, James Keck, Kenneth Carl Dumke, and Greg William Massman. Thank you Barb! Don't forget to check out the Supplemental Site from time to time! Here is a nice article from the Sun News about the 50th Reunion! We have added a new feature, the 50th Reunion Pix, which allows any Class of 1960 classmate to "upload" pictures after they log on to the web site. We hope many of you contribute pictures from the reunion. The new name for the school that is replacing Farirwood has been named "Grindstone Elementary School"...........update on Fairwood School. New "Florida Get-Together" pictures and a 1956 birthday party picture! We have added a new page, let us know if you have items to add! Welcome to the Berea High Class Of 1960 web site. Please spend some time, create your profile and let others know about the site, most of all have fun with it! This site is very interactive. You'll be able to easily add information and photos yourself, contact other classmates, help find classmates, etc. We're excited about the possibilities! If it’s your first time to the web site, please login by clicking the Classmate Profiles tab, scroll down to your name, click it and enter your current contact information. You can provide as little or as much information as you like without fear of spam. You can set your profile to display your contact information or to keep it private. It's up to you! This website is private and the information in it is not available in search engines, although the website's homepage is. You can also share personal updates, memories, photos and videos with your classmates here. Enjoy looking at the profiles of old friends and don’t forget to add your own photos and comments. Check back often as classmates will continue to post new photos and updates. 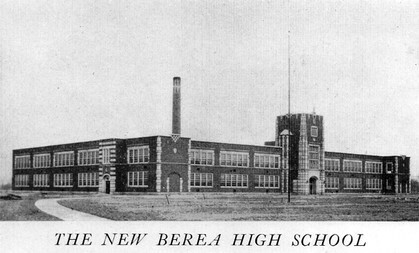 Here is a link to the Berea Historical Society. Click to hear the Pride of Berea; the Berea High School Marching Band! To upload pictures: First I would select the photos you want to upload and save them on the computer desktop, this will make them easier to find. Make a note of a picture number if you have not saved it with a particular name. · This will allow you to select the photo you will upload to your profile. · You will see what your picture looks like, you can add a caption or upload another picture, after you are finished, click Save Files. · Now click on Home Page and click your name in the Profile Updates!